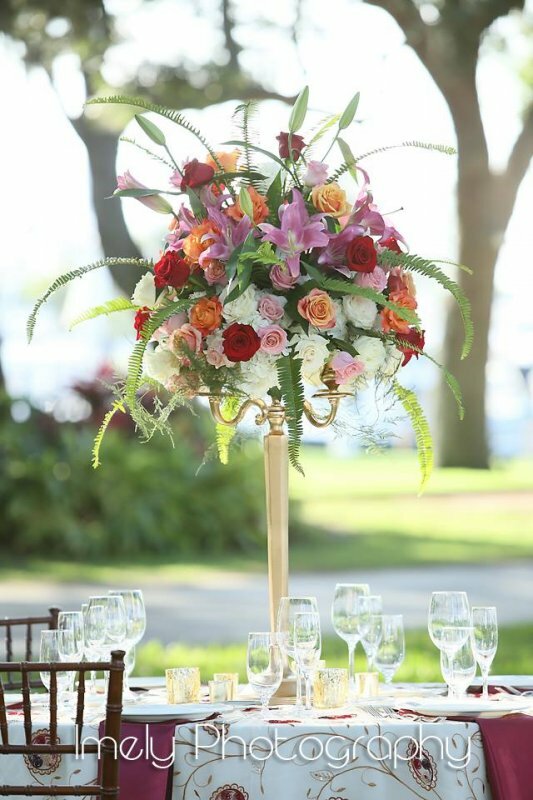 This vibrant wedding will knock your socks off! 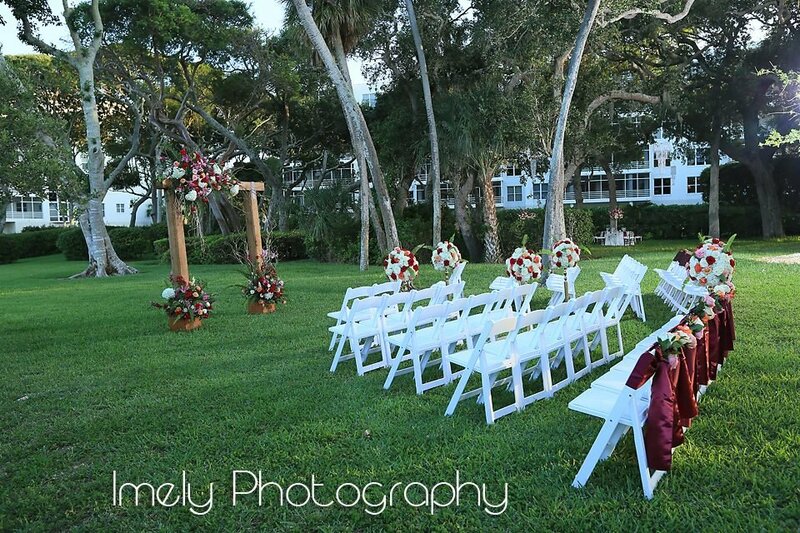 While blush tones have been very popular this wedding season, we opted for deep, rich, and bold tones that looked absolutely stunning with the backdrop of the Longboat Key Club and were a perfect match for the luxurious linens the bride chose! 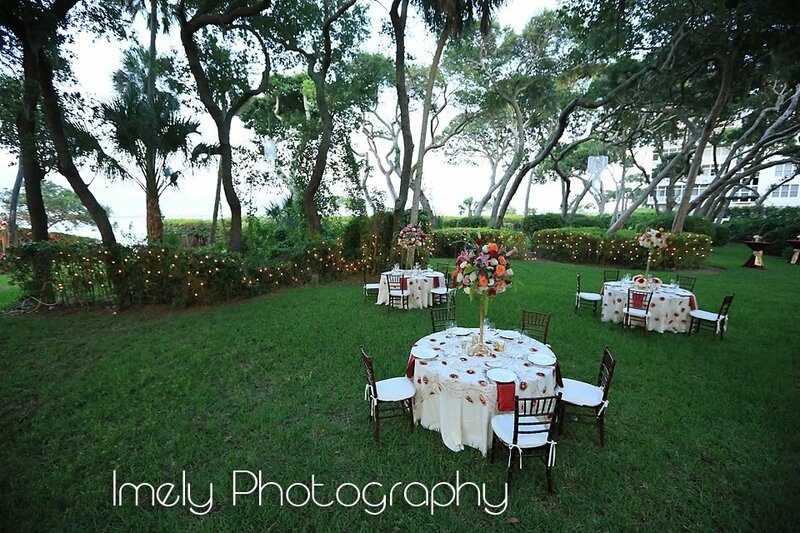 This particular venue on the LBK property features a lovely water view but without the sand, which some couples don’t want. 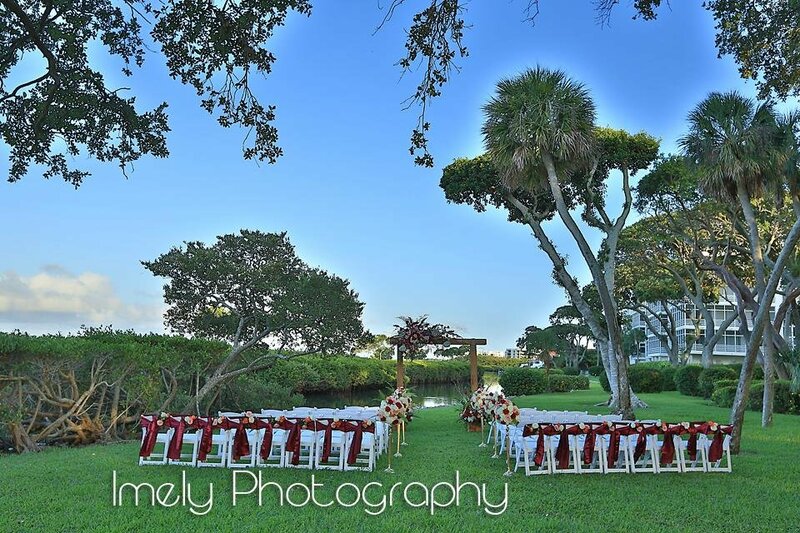 It’s near their Marina and has loads of gorgeous, stately trees for shade and makes a wonderful spot for an all-outdoor intimate wedding and reception. 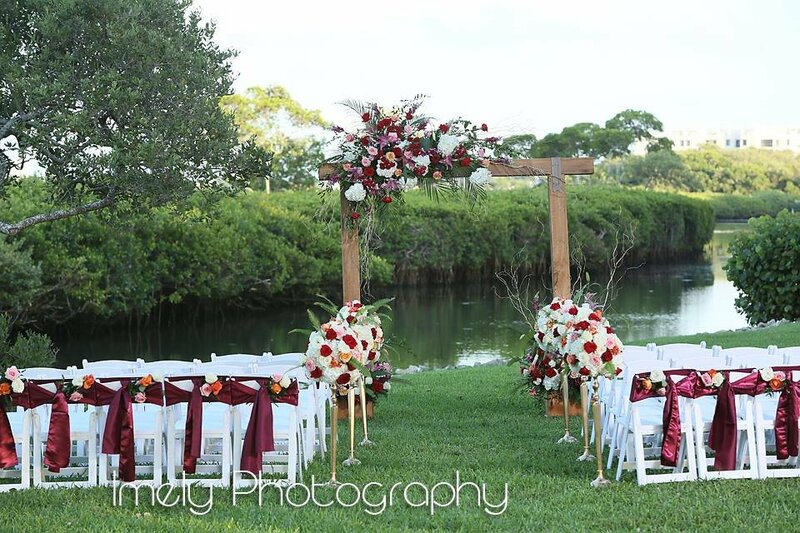 We chose our cedar arch for the ceremony, which was perfect for this site, and topped it with memorable bold-colored flowers in deep reds, pinks, corals, and creams with lots of foliage. It was breathtaking! 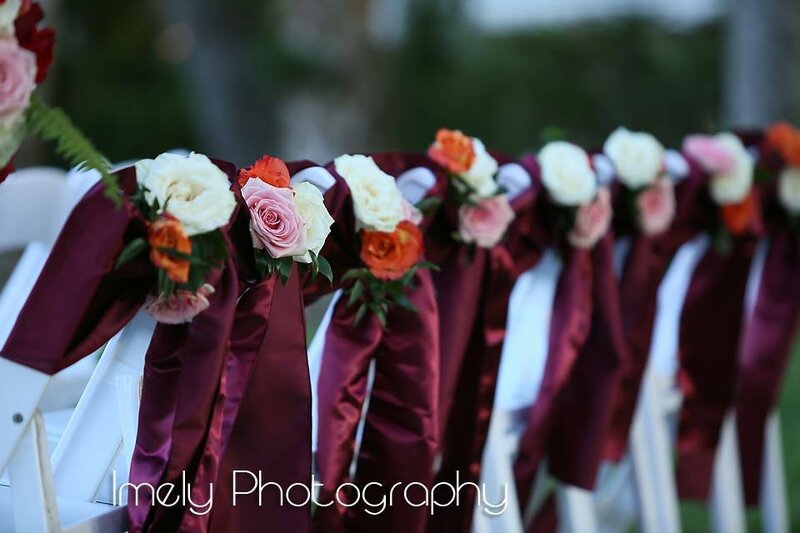 For the back of the aisle we pulled in more color by using vibrant richly-colored chair sashes and added a cluster of roses for a greater pop of color against all the lush greenery. 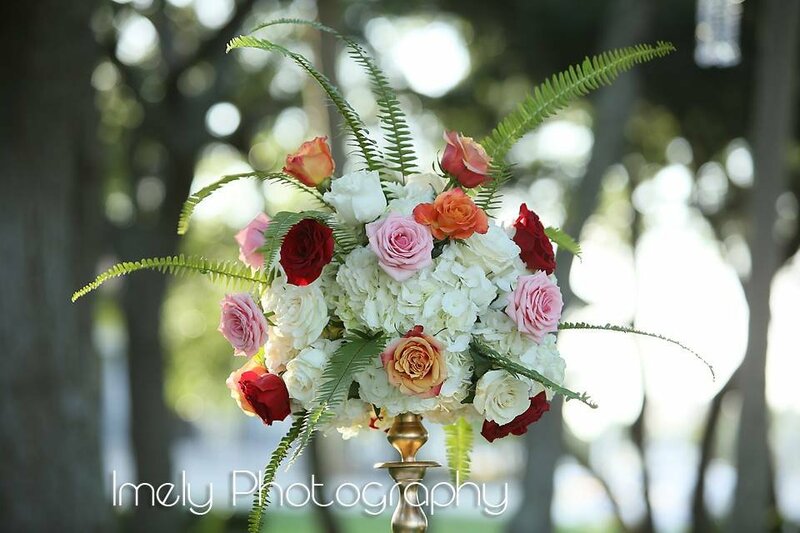 The following colorful roses were used throughout this beautiful wedding: red roses-Freedom, coral roses-Free Spirit, pink roses-Sophie, and cream roses-Mondia—these roses worked splendidly together! For the aisle, we used gold stanchions with flowers and then these were transferred to large gold candelabrum on the guest tables while the guests were at cocktails. Additionally, we added 3 small similar arrangements around the base of the elevated floral centerpieces and nested gold mercury votives into the grouping, too, for an extra bit of shine and sparkle! 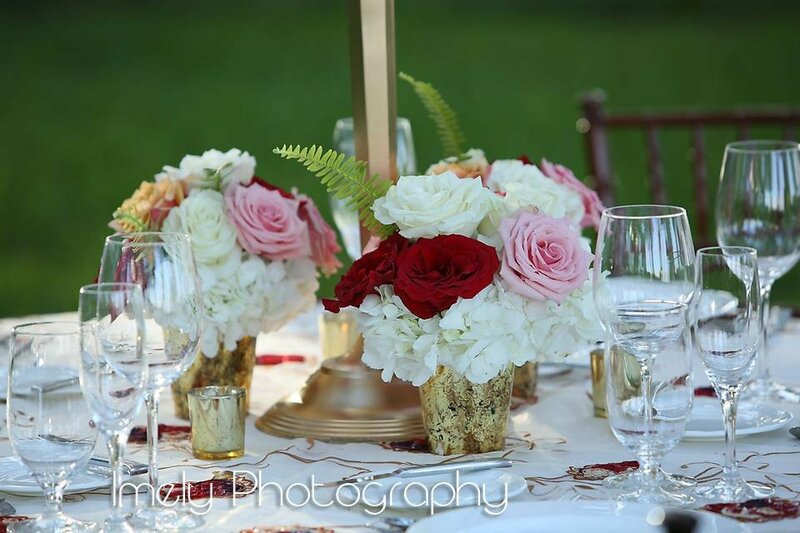 It was a dazzling look…the gold looked amazing with these rich, deeply-colored flowers. For the cocktail tables, we added small, but super pretty arrangements in our gold mercury glass holders. 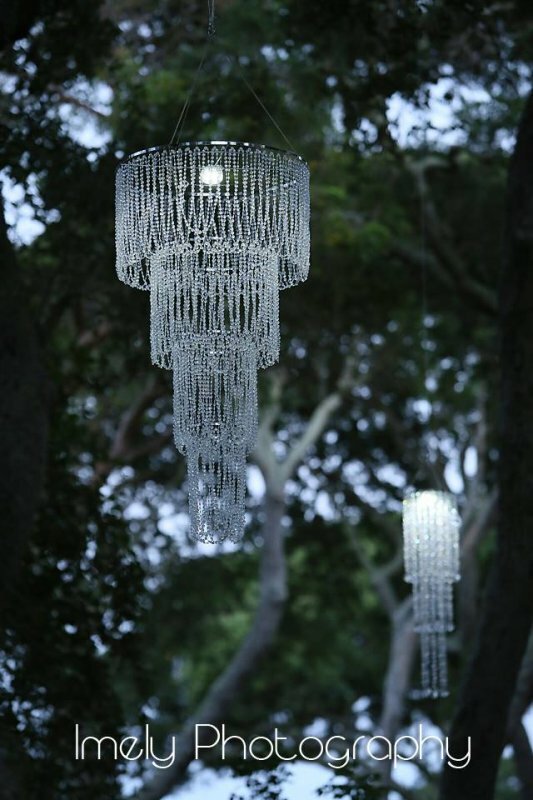 It was very elegant and colorful! 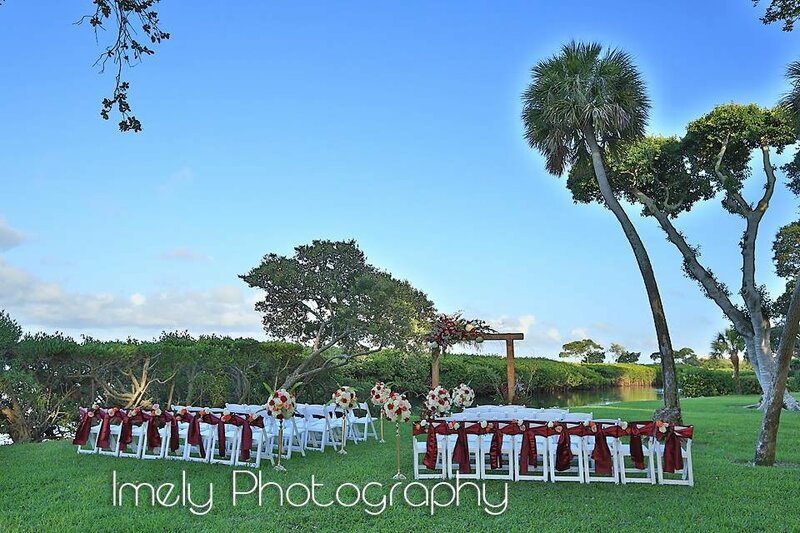 The linens from Linens by the Sea were selected before we decided on colors for the flowers, so we pulled the deep dark reds with the corals and added some pinks as the transition flower from the 2 deeper tones in the linens. 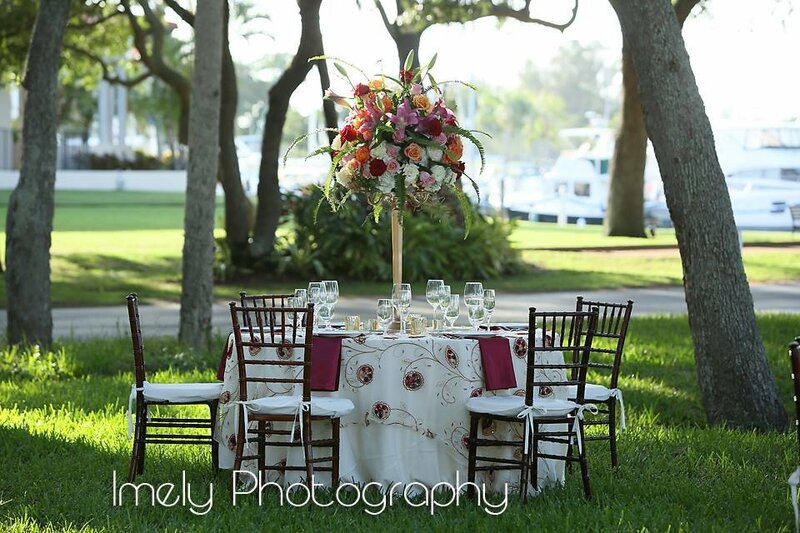 Linens by the Sea has so many fabulous linens and sheer overlays to work with—they can make your wedding day look spectacular. 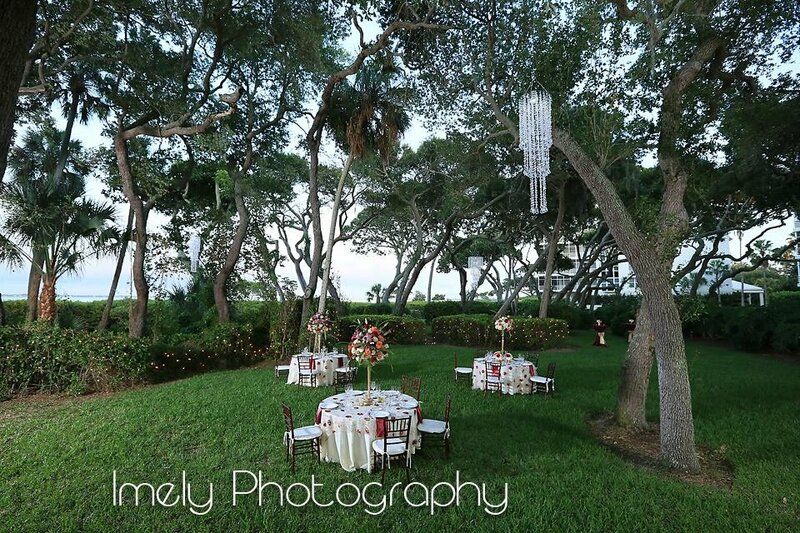 The chandeliers were hung in the trees for lighting and added that elegant touch to the whole wedding area! It was truly a beautiful day!